On Friday 20 November 2015, NSW Minister for Roads, Maritime and Freight, the Honourable Mr Duncan Gay, under sustained pressure to do so, quietly released the 320 page WestConnex Updated Business Case. A media release by Infrastructure Partnerships Australia playfully stated that ‘WestConnex is the triple bypass needed to fix Sydney’s congested heart’. Gleaning the business case first hand, it quickly becomes apparent that the so called WestConnex is a breathtakingly ambitious but doomed to fail massive urban road project, premised on a simple and outdated belief that carriageways (cyclists are legally classed as vehicles on carriageways, but are not permitted on motorways, such as WestConnex) are the natural domain of cars, and private car ownership a sovereign form of transport. Shared modes of commuting, that is, public transport and active transport (walking, cycling), are given marginal status in WestConnex’s vision for the future. Despite the planned expenditure of billions of dollars of tax payers’ money and the forced acquisition of swathes of heritage homes at market rate, there is nothing in the report to guarantee that WestConnex will solve Sydney’s congestion problem in the long term. Rather, as cogently illustrated by UTS transport planning academic Dr Michelle Zeibots, who wrote her PhD on induced traffic growth from urban motorway development, congestion will be just as bad in year 2031 as it is today. So what’s the point of building this behemoth you ask? The answer is crude and simple. The true underlying aim of WestConnex is to promote private ownership of cars, and reward patronage and favour to businesses which build the concrete motorways that will carry these cars. It’s free market ideology writ large – nothing more, nothing less. WestConnex represents a deliberate rejection of strategic planning for environmentally sustainable forms of transport, thereby ensuring that walking and riding a bicycle for work and leisure, remain second class options well into the twenty-first century. 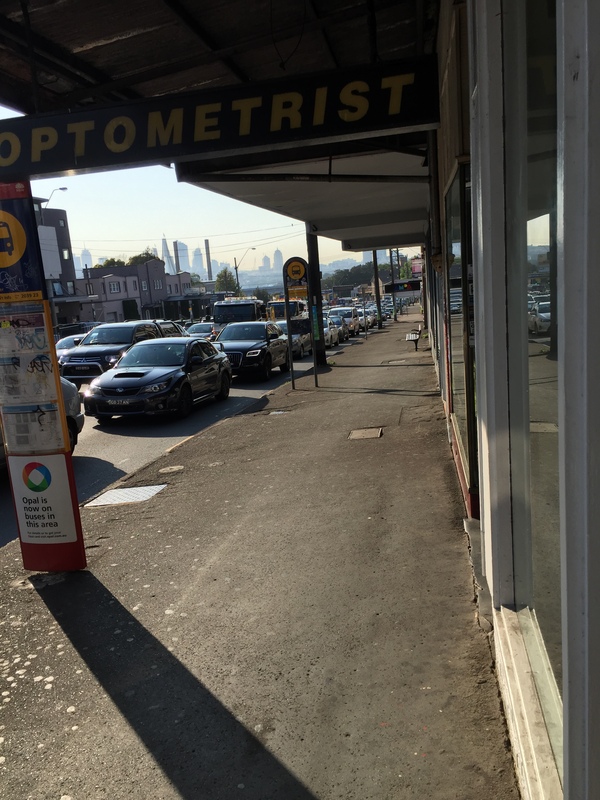 WestConnex propagates the modern myth that driving a car is a natural evolutionary outcome of human progress, and that doing things at great speed is somehow better than taking one’s good time. This blighted naiveté, this astonishingly false consciousness, will translate into a decline in public health for decades to come. A casual survey, I conducted, of active transport keywords occurring in the 320 page WestConnex Updated Business Case, highlights, by inference, the secondary role that the state government envisages for cycling and walking, as institutional forms of transport. What is notable in the above table, is the single mention of the humble four-letter word ‘walk’; the one thing that every able-bodied man, woman and child is born with the blessed ability to do, and the very thing that WestConnex denies, rejects, negates. To be blunt about it, only a fool would consider this a satisfactory state of affairs. Anti-WestConnex groups on Facebook, concerned inner city residents whose close-knit communities will be swallowed up by this concrete monster, affected local councils, such as Leichhardt Municipal Council, and Green groups, continue to rally, protest and petition against the terrifying juggernaut that is the well-organised partnership between patrons of the Liberal party and powerful business interests. Alas, it may well be too late to stop this. To borrow a hackneyed phrase, the horse has well and truly bolted – or, should one say, the car has?